5th annual Calories and Cholesterol Tour! If we were the Starship Enterprise, our five year mission of exploration would be complete. 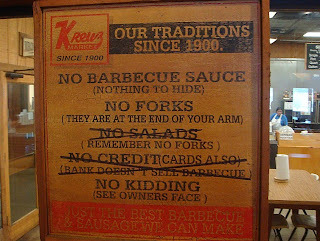 Thank goodness we're just eating barbecue! 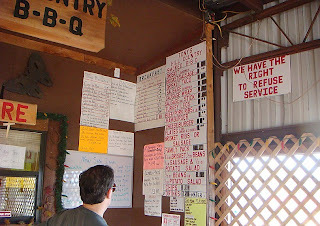 There seems to be no limit to the number of BBQ joints in Texas to sample so we have years and years of "work" ahead of us! Yay! As usual this year's tour included some of our favorite places from previous tours, plus a bunch of new (to us) places we had not tried before. I have to say we did not have a bad meal this year. Some were GREAT but none were less than good or average. We visited Lillian, Burnet, Bertram, Spicewood, Austin, Lockhart, Luling, Gonzales, Smithville, Halletsville, Schulenburg, and Marlin. Over 6 days we ate at 13 different places. As always, I will mention that the opinions expressed below are just that, opinions, and are valid for that piece of meat on that particular day. 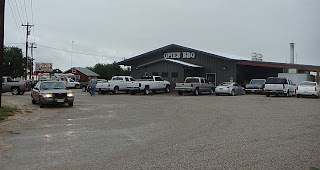 Anybody can have a bad day or a great day with BBQ. 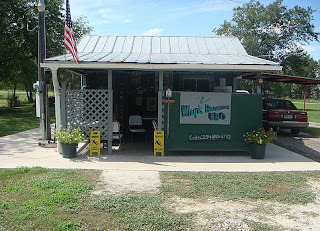 the trick is serving consistently great food day after day, visit after visit. Someday Scott will put up his own blog and he can tell you how wrong I am about everything. 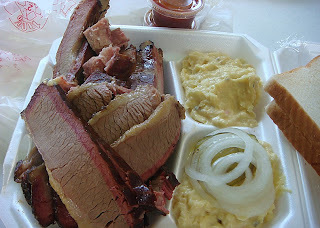 This is another joint from Texas Monthly's top 50 list and with good reason. This little shack is located down a tiny potholed Marlin suburb street. Inconveniently, the street sign for Bennett Street is missing on the main drag. That made finding it fun. However it was well worth the trouble. 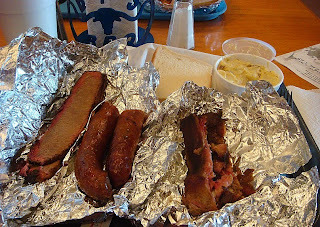 For about $16 I got several pounds of brisket, sausage, ribs, and pork, most of it awesome. 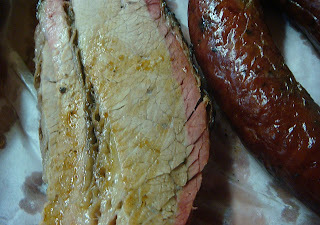 The brisket had a killer smoke ring, was plastic fork tender, and full of smoke flavor. The ribs were falling off the bone and similarly smoke filled things of delight. The sausage was the only disappointment. It was a bit greasy without much taste to it. After a few sample bites I left the sausage alone. The tater salad was a nice mayo/mustard mix and was the fine and creamy kind. Very tasty. The funk factor is off the chain and the food is great. Note how I conveniently photographed the sign with the hours and phone number so you can taste test for yourself. You should! Another long time favorite of ours and they almost never disappoint. 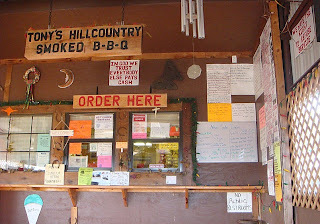 While I waited for them to pack my 5 boxes of jalapeno cheese sausage (2 1/2 going to other folks) Scott went around and ordered some ribs and brisket for breakfast. While he was off ordering drinks and such, I snuck a few bites and they were mighty fine. The brisket was extra tender and very smokey. I had one bite of rib, and it was tough, but also very smokey. Scott said his ribs were tender and great. 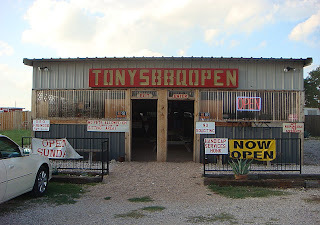 I still say their jalapeno cheese sausage is the best in the world and I'm still looking for some place to prove me wrong. Kreuz has made a few startling changes recently. They now accept credit cards (they always did on mail orders anyway) and have, gasp, salads! Next thing you know they will have sauce and forks! Damn yuppies!! Ha ha. I don't care. They still have the best sausage in the world, to my mouth. A long time favorite of ours and another "must" stop on every tour. Multiple reviews and photos are available in earlier tours. I have never had a bad meal at Black's and I have never had a bad piece of meat. 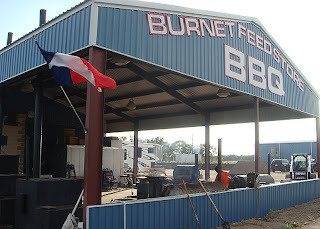 Their brisket is consistently tender and smokey and their ribs are the same. 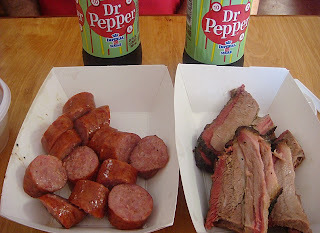 I've always thought their jalapeno sausage fell well below Kreuz, but I think they are definitely closing the gap. Just check out those jalapeno flakes in the sausage below. This time I noticed they are selling pre-packaged rub and even wood chips so you can try to match their great taste at home. A great marketing idea, but somehow I doubt you could come close at home. 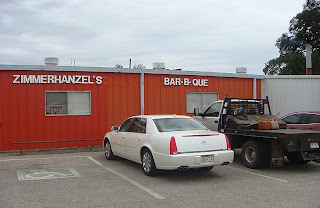 We had noticed this little joint on the way down to Halletsville and mentally marked it for a future visit. 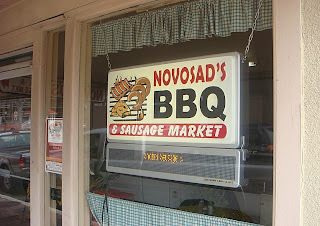 After Novosad's turned out to be a bit of a disappointment, I bugged Scott to pull in there on our way back north. I'm glad we did! 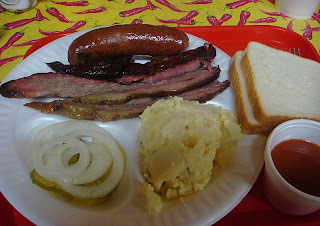 Apparently they don't cook lots of BBQ here, it's mostly a meat market, but they had some brisket and some sausage left. I was a little hesitant when they warmed it up in a microwave, but on seeing the brisket it turned to optimism! Look at that killer smoke ring! A thing of beauty indeed!! 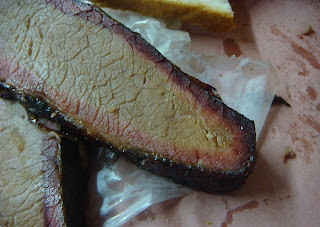 The brisket was very tender and full of smoke flavor. Mighty nice. 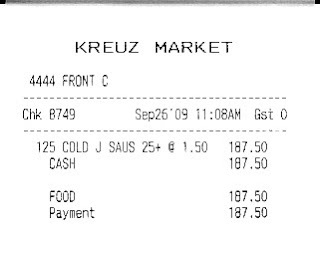 The sausage tasted for all the world like Ekrich from the grocery store. Strange considering their sausage is a specialty. Guess that's all they had left after 1 pm. The sauce was a nice mustard/tomato mix and a bit tangy. 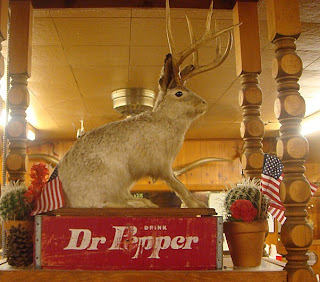 To make things even better, they had REAL Dr Pepper in the cooler. The one made with Imperial Pure Cane Sugar instead of corn syrup. How cool is that? I was sorry we missed out on the pork ribs and the good sausage, maybe next time, and there WILL be a next time, based just on that brisket! I never did see the guns inside, maybe they're in a back room or maybe they just come out when robbers appear. BBQ and guns make a nice combo, though. Catty corner across the street was an even better sign and a combo that might not be so good. 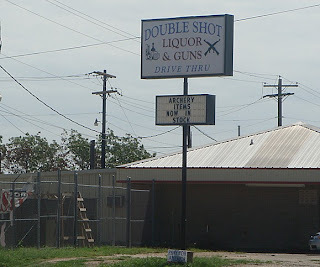 Drive through liquor and guns! I love Texas! 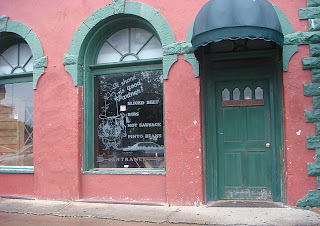 According to the sign on the door, we would have better luck here today and, sure enough, the sign was gone and they were open for business. 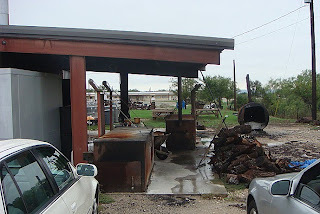 Inside is a tiny meat market and a small BBQ operation, one of the smaller joints we have sampled this trip. 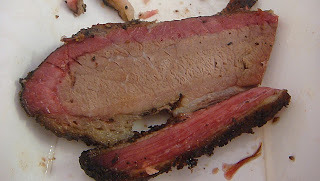 The brisket was tough and chewy and had no smoke flavor. Scott said the first slice he had was great, but the others weren't. 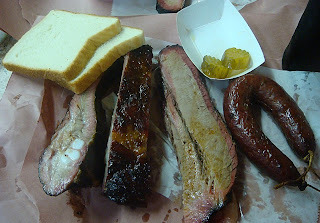 The 2 ribs I had were tiny, including a rib tip, and both were chewy, except one end of the bigger rib. That one bite was awesome, the rest was a chore. I think next time I will need to sample from deeper inside the rack. Scott said his were nice. Ah well, it all depends on when you stand in line! The sausage was very tasty but a bit dry. A coarse grind with a nice mild mix of spices. The highlight of the stop, for me. The tater salad was an average mayo blend with coarse potato chunks. The sauce was heavy on the vinegar and a mix of tomato and mustard. Maybe they were off a bit because they had been closed the last 3 days. We'll give them another shot on another day, but today they were not worth the trip. 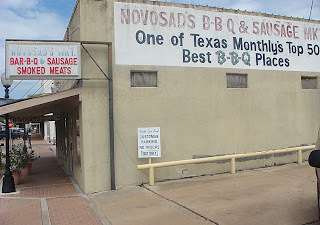 Following a long and interesting visit to the Gonzales museum, we headed to Halletsville where we found our chosen destination, Novosad's BBQ, closed! Not permanently, but for a couple of days, according to the sign. 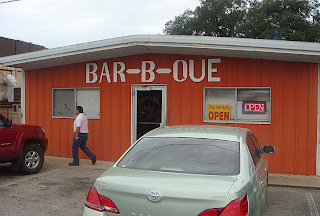 We next wandered down to Yoakum looking for a joint called Honey Do BBQ. After we failed to find it, I inquired at the chamber of commerce and was informed they had recently moved out of town down 77 closer to Victoria. 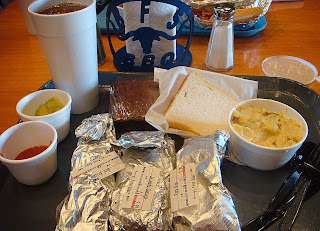 They also recommended Fat Albert's BBQ in Yoakum which hadn't moved out of town. Well that was good enough for us, so we wandered over there and found them closed until 4:30 pm. 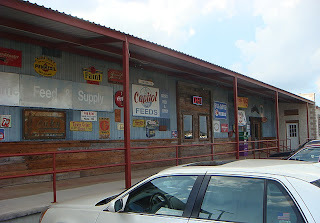 It being 3:30 and us not having much to kill time in Yoakum for an hour, we opted to backtrack and have another go at City Market in Luling. Dang, it sure is tuff having to take that as our 4th choice. :) Yum! Awesome as always. Another small downtown market with a large reputation. 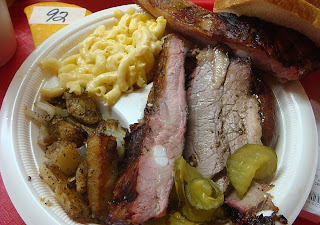 On this day both the ribs and the brisket were downright tough and chewy but had plenty of smoke flavor. The coarse grind sausage was the highlight but it suffered from a tough skin as well. For sides I had some average mac and cheese and some nice fried potatoes which tasted just like mine at home (ie. awesome). We are definitely coming back here on another day based on taste alone. 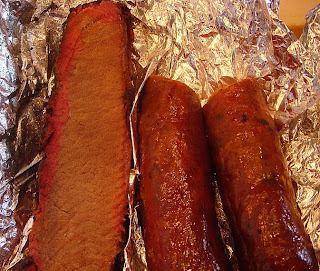 Tough ribs or brisket can happen to anyone on any given day. 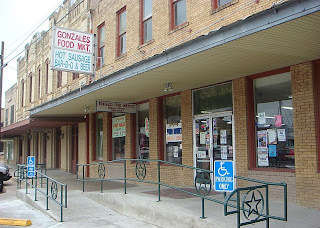 I'd also highly recommend the Gonzales historical museum for a nice slice of important Texas history. 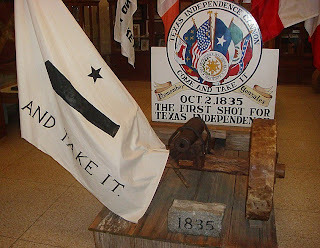 Yes, they have the real "come and take it" cannon on display. Awesome! One of the great things about taking "the tour" every year is going back to our favorite places. 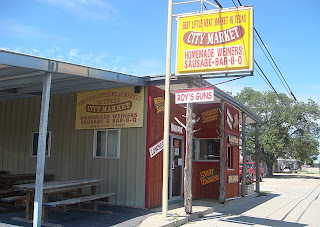 All you have to say to me is "City Market in Luling" and my mouth starts watering. The brisket was just a tiny bit dry this year but everything else was awesome. Even so the brisket just crumbled at the touch of a plastic fork. Just look at that smoke ring. How do they do that? This is still my #1 all time favorite joint and they did nothing to change that this trip. Another place which makes many lists and I can see why. This is another home run spot, snd cheap, too! 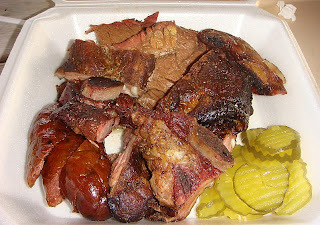 For about $9 I got a 3 meat plate with 1 rib, 1 sausage, and some nice brisket. 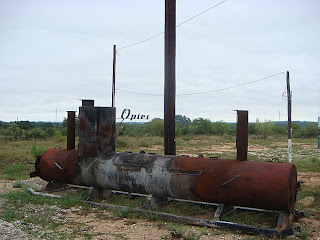 All was first rate, top of the line BBQ meat. 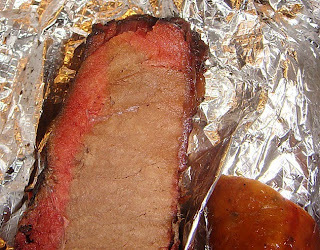 The smoke flavor of the brisket was subtle, but stayed with you. We have had some that was more tender this trip (it cut easily with a plastic knife) but this was as tasty as any. The sausage was a flavorful coarse ground and the casing was just slightly tough. I had a little trouble getting through some of it with a plastic knife, yet it chewed just fine. Just the right amount of moisture, not greasy or dry. I wish they had a spicier version, but their mild was tasty. The rib I had was the highlight. It was as good as North Main and I don't get to say that too often. If we weren't having another BBQ meal a few hours later I would have gone back and had a couple more ribs. They were falling off the bone tender and plenty of smoke flavor with a perfect crust. The tater salad was very good with a mayo base and sweet pickle flavoring. I liked it a lot. The pinto beans were perfect, too. The sauce had a unique taste, sweet and very tomato-ey with a bit of tang. Maybe I'm crazy, but it sort of tasted like V8 with honey. It was actually pretty good! This place certainly deserves its lofty reputation. 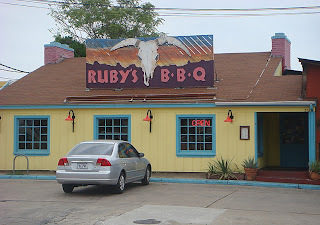 Ruby's is another one of my old favorites and a scheduled stop on the tour every year or two. 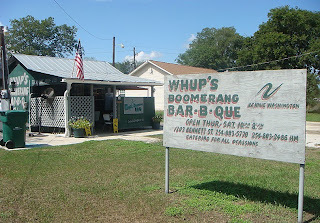 They have an excellent spicy sauce, their brisket never disappoints, and they have killer fried potatoes. Everything was right on form so nothing to do but post the latest dinner photo and add one from the outside, which, strangely, I had never shot before. We'd heard a lot of high praise for this joint so we thought we'd swing by and check it out for ourselves. Frankly, I don't get it. 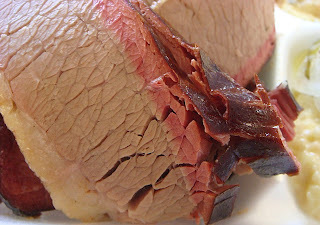 With the first bite of brisket Scott said "roast beef". And that's pretty much what it tasted like, not BBQ. It was tender and moist but no smoke flavor at all. The ribs were chewy and a bit dry, again with no discernible smoke flavor. 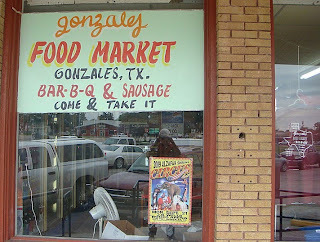 The sausage was almost a clone of what I had at the Burnet Feed Store which was an excellent fine grind jalapeno sausage. Easily the best meat I had at this joint on this day. The highlights of the meal, and Scott concurred, were the sauce and the chocolate chunk brownie. The sauce was a very nice mix of sweet and spicy and was easily the best sauce we have had on this trip, so far. The brownie was massive and had some real heft to it. Big chocolate chunks inside accounted for the extra weight and were most welcome. 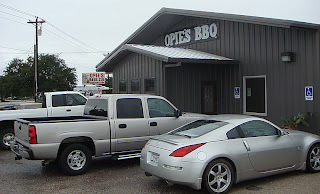 Maybe we just came on a bad day, but on this visit Opie's certainly did not live up to the praise we have heard elsewhere. Our last stop of the day was the only real disappointment. 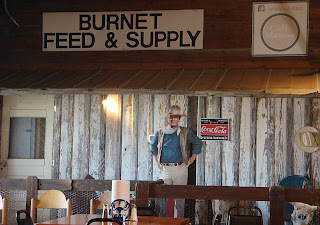 In terms of funkiness, this place had it in spades over Burnet Feed Store, but the food wasn't close to being in the same league. All the hand lettered signs inside and out reminded me of a Beverly Hillbillies episode where Granny is operating one of her businesses and has Jethro do up all the signage for her. Not faux funk. Real funk. Inside there are picnic tables on a gravel floor and there was a nice sink for washing up at the counter. 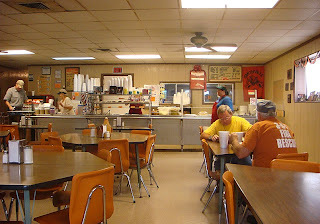 Behind the counter, which is set off with sliding windows, the little lady running the joint had a big blue lazy boy recliner to await her next customers. It was just an awesome place that clearly someone has put an awful lot of work and love into. Inside they have an extensive menu that runs about 4 feet down the wall and includes both a breakfast menu and one in spanish. Not something you see often in BBQ joints. 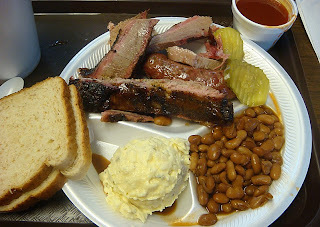 We picked the 4 meat sampler plate and Scott and I opted to split it as we'd just finished over at the Burnet Feed Store. 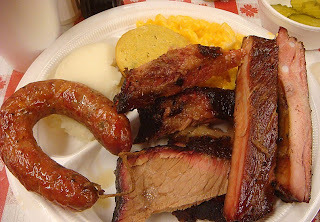 The 4 meat plate included brisket, sausage, pork ribs, and beef ribs. 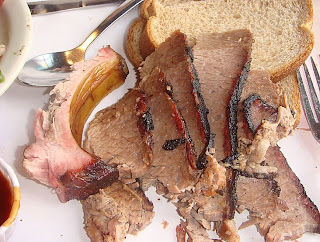 The brisket was tasty, but it was also very strange. Not exactly BBQ, but more like pot roast made in a crock pot. It was very tender and juicy but zero smoke flavor. It would have made a dynamite roast beef sandwich with some brown gravy. The sausage was a fine grind, not very spicy, and a little chewy. Scott hit the nail on the head when he said it would make a great breakfast sausage. 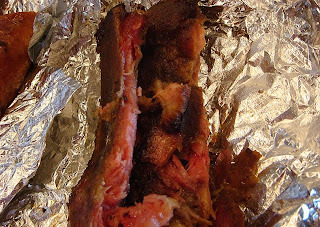 The pork ribs (we just got 2 very small ones) were very tender but did not have much flavor. Definitely no smoke flavor at all. The beef ribs were tough as leather and not a lot of flavor to them. Overall, I'm really glad we stopped there for the experience, but the food was definitely lacking. 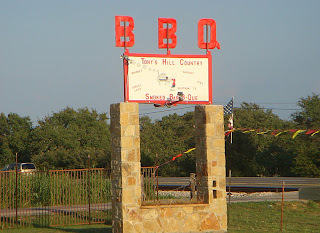 We had planned to hit another reviewed spot near Burnet, but found it had gone away. After asking at the hotel, they recommended this new place in town which had only been open for two weeks. From the outside it looks a bit kitschy, the standard old signs, etc. hanging outside in sort of a faux funky manner. Inside, we waited a long time while a lady in front of us made a big order but finally we got our turn. 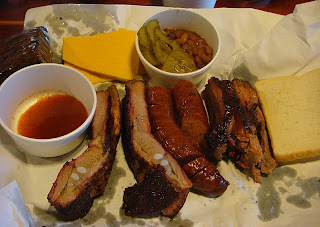 This is a "meat by weight" place (except during lunch when they offer plates) and I ordered 1/3 pound of brisket, 1 jalapeno sausage, and a couple of ribs. 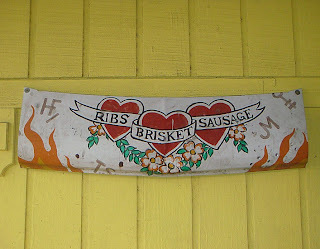 When he picked up the rib rack to carve, the rack went limp, always a good sign. 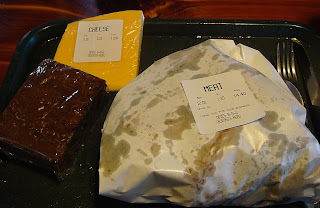 The meat was individually packaged and weighed, with a sticker on each one showing the price. I added some tater salad and a massive brownie for just 99 cents. 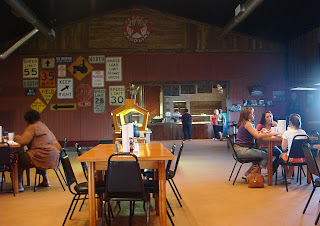 The dining room is a big airy cavern that sort of reminded me of Kreuz in Lockhart, but with decor more like Cartwright's in Bastrop. Down at the end of the room a life sized smiling cut out of John Wayne watched over us. Really. The food here was absolutely awesome. 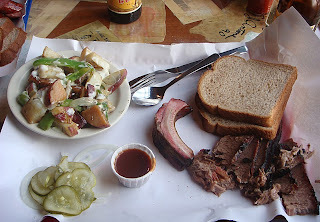 The brisket was so tender that if you tried to pick it up with your fingers you only came away with a small piece. Perfectly moist. Deep, deep smoke flavor, on a par with the best I have had. 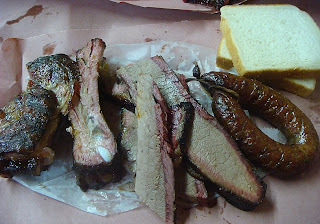 Darned near brisket nirvana. The ribs were similarly tender, moist, and delicious. Maybe not North Main good, but certainly in the same neighborhood. 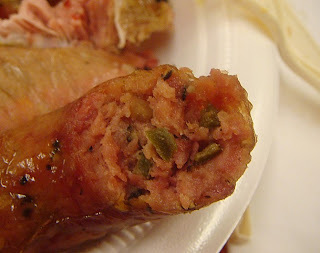 The jalapeno sausage was just perfect. A fine grind sausage with a homerun blend of spices, moisture, smoke, and a casing that was a snappy, easy chew. The potato salad was a coarse chunk with mustard blend and about average. Scott had the beans and said they were very good, complete with brisket bits. Their sauce was another ketchup/mustard mix but I sure didn't need any on their wonderful meat. The home made brownie was an awesome chocolate gingerbread and it was so big I had some leftover for later! Anyone who knows how I like dessert will realize that is a rare thing. As we left we stopped to take a few pictures and came across the massive pit enclosure on the north side. Clearly this is a serious operation. 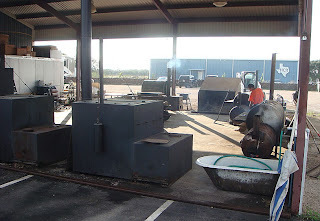 They are on a par with Kreuz in Lockhart and Cooper's in Llano as far as pit set-ups are concerned. 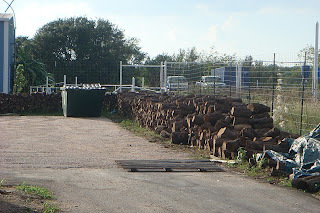 The back parking lot is lined with double rows of smoker wood for close to 100 yards. We didn't go investigate the wood type, but whatever they are using works great. This joint may be new, but I have a feeling it will be around for a long time and be very popular. No wonder John Wayne was smiling. 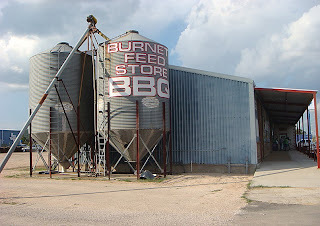 They have a website at http:www.burnetfeedstoreBBQ.com, but when I checked, it was still just a place holder. 5th annual calories and cholesterol tour! !